Learn to build your own wooden canoe with canoe builder Bart Deseyn. It’s a very rewarding experience and achievable to everyone, even to those with no prior experience with woodworking. During the canoe building workshop you work with the same simple hand tools you probably have in your tool box. Canoe builder Bart will guide you through the entire process of building a canoe. In simple steps you will see the genesis of a wood strip canoe. You will develop different skills during the workshop. Working with a spokeshave for instance or laminating with epoxy. Bart will pass down his knowledge and will give you lots of boatbuilding tips & tricks. Strip building is a canoe construction method where it comes down to gluing long narrow wooden strips together on a temporary form. Once the canoe is sanded down the inside and outside are lined with glass fabric and epoxy. That laminate makes the canoe strong and waterproof. The combination of wood strips and glass fabric-epoxy gives a very strong, rigid and lightweight construction. Strip built canoes are exceptionally stiff which provides a very efficient energy transfer while paddling. Moreover, they are easy to repair and nearly indestructible if treated properly and maintained correctly. You don’t need any gear to participate in the workshop. Everything you need to build the canoe will be provided by Freeranger Canoe and is included in the price. We also provide personal protective equipment when needed. Although wooden canoes are strong it’s inevitable they get scratched, or worse, damaged. Luckily a wooden canoe is very easy to repair. During the canoe building workshop you will learn how to sand the canoe and apply a new coat of varnish. Something we recommend doing every year. Bart will also explain how to repair deeper damages and how to repair seats and gunwales. For more general info check our workshops page. In consultation we decide on a schedule to build your wooden canoe. Depending on the type of wood strip canoe you want to build that will take up between 80 and 100 hours. We can build an evening or day each week or group the construction in one or more multi-day periods. 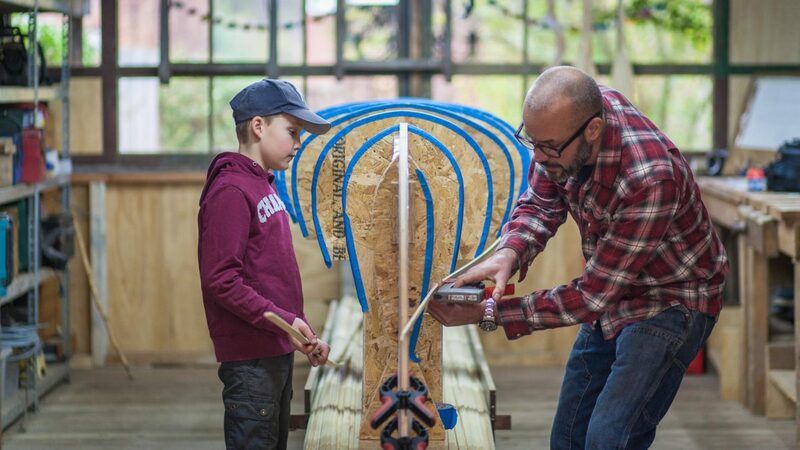 To book a canoe building workshop, use the registration form below. We will get back to you to plan a schedule. Registration is complete once we receive a deposit of € 200. The balance of € 500 is due 40 days prior to the start. The workshop fee does not cover the acquisition of the canoe. After completion of the workshop the built canoe can be purchased with a 10% discount on the price when new. Check our webshop for the pricing of our canoes. Courses are scheduled year round, check availability. Work starts at 09:00 hrs and ends at 13:00 hrs. In total we will be working for about 50 hours. A Maximum of 4 participants is accepted. To book this canoe building workshop, use the registration form below. We will get back to you with more details. Registration is complete once we receive a deposit of € 150. The balance of € 300 is due 40 days prior to the start. If you would like a customized workshop for your group don’t hesitate to contact us. We are very flexible and welcome special requests from companies, clubs, schools, etc. We can even consider building a canoe on location. Canoe building is very rewarding and an excellent tool for team building. Also check out our paddle making workshops. Please use the contact form below to make your request. We will get back to you as quick as possible. For special requests you may also want to give us a call at 0032 475 804 302.